Sheldon Cottage, named after the Sheldon family who built the manor house in 1539, is a spacious but cosy award winning Cotswold one bedroom cottage, ideal for two, in the extensive peaceful grounds of The Manor House. Sheldon Cottage, named after the Sheldon family who built The Manor House at West End in 1539, is a spacious but cosy award winning one bedroom Cotswold stone holiday cottage in the extensive grounds of several acres surrounding The Manor House, Broadway. 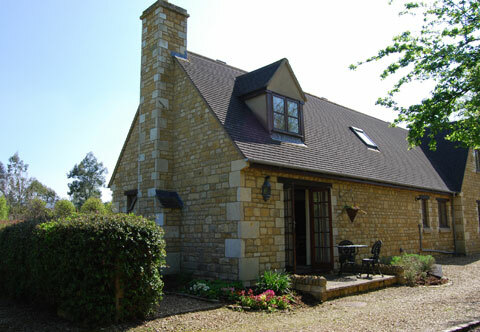 Ideal for two guests, Sheldon Cottage, which was refurbished in February 2015, is tucked away on the edge of a courtyard of three holiday cottages in a peaceful rural location just a few minutes' walk from the centre of the pretty Cotswold village of Broadway, the nearest pub and a wide range of independent shops, galleries and restaurants. Accommodation details: Entrance from small terrace into triple aspect large spacious living room with sitting, dining and kitchen areas which have been decorated and furnished to a high standard. There is an attractive Karndean slate effect tiled floor throughout the ground floor giving a contemporary look. The living room is furnished with a large leather sofa, digital HDTV and DVD player, pine dining table and chairs, Cotswold stone fireplace with electric stove in addition to full central heating. The fully-equipped kitchen has a ceramic hob, electric fan oven, fridge freezer, microwave and dishwasher. A spiral staircase leads to the first floor carpeted galleried bedroom with king size bed, en-suite bathroom (bath with over-bath power shower, wc and basin).